The times of simple service fulfillment are long gone. Now customers demand for not only immediacy in service, but also for a superior customer experience. A lot of this can be attributed to a person’s metamotivation – a term coined by Abraham Maslow to describe the motivation of people who have crossed all key stages of the Maslow’s Hierarchy and are now reaching out to be the best that they can be. We are seeing this unstated expectation of surpassing customer experience (CX) across all industries and touch points. The success of all tasks – from simple things likes paying a bill to more complicated tasks like a new purchase – is now measured in how the customer ‘felt’ during the entire transaction. Every aspect of the business and every stakeholder contributes to the customer experience success. It is critical that CX not be relegated as the task of a single entity in the organization. One team could be responsible for measuring the effectiveness, but all teams must work together to achieve it. CX is being very loosely to identify with a customer’s transactional activities only. CX is the customer’s perception of their relationship with the company resulting from all interactions during the customer life style. Customer experience is the end to end journey of the customer with the company and not just few touch points or critical moments when the customer interacts. It is the cumulative impact of multiple touch points over time which results in real relationship feeling or lack of it. A great CX is no longer optional. It is understood that any organization not delivering a superior CX is not built to last. Customer experience is everything an organization does for its customers and how it makes them feel. The challenge for any organization is to shape customer’s experience such that they appreciate it, remember it and share it with their friends which drives customer advocacy. A great CX is built around a deep understanding and intelligence of the customer’s life stage and being able to predict where they will be in a few years and what their real needs would be. This is where technology such as predictive analytics comes into play. 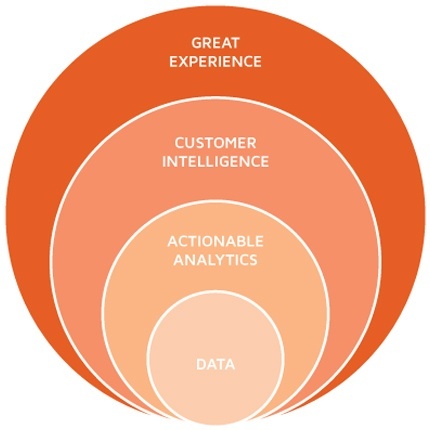 Organizations usually have enough data to align their services to the customer’s life cycle. However, that data is siloed and in multiple versions and with multiple owners. The result – no one has a complete, single view of a customer. Everyone talks CX, but a very few companies deliver it. Organizations that have been able to master the art of delivering a superior CX keep the customer at the center of their business. Not at the fringes. These may sound simple, but are not. It would take great effort on the organization part and on the part of all stake holders. The most important aspect would be to involve the customer in this process.